Flavor Text: Science is our sword and faith our shield. Danigral - 2 out of 5. A mid to late game character that has a good icon lineup. I have to agree with livingend on this one, something happened in playtesting to rein him in and now his ability isn’t worth the number on top since there is a plethora of removal that happens outside the tiny sliver of window when characters are committed to stories. That said, there are some tricks that you might be able to pull...perhaps THIS is why they had that Voice of the Jungle promo in the last season kit. Haha. mnBroncos - 3 out of 5. I think this guy will be a one of in a lot of Agency decks because of the drain multiple domains part you can get him out on turn 4 and he is a big body. However, I didn’t see enough Hunter support to really push it as much as I see in Government. Obtuse - 4 out of 5. Nice. I want more Hunters if I can make makeshift Claret Knights out of all of them. 7 is steep, but multiple domains maybe takes some of the sting out of it. livingend - 1 out of 5. Eeesh. 7 drops that die to Khopesh before doing anything or go insane when pitted against a Degenerate Serpent Cultist are just not playable. Somehow Hunters of Ardenne evoke the feeling that they originally provided permanent immunity to all Hunter characters but the resulting untouchable horde turned out to be too powerful during playtesting. The logical result is a sort-of immunity that doesn’t really protect you from anything and three open slots in your would-be hunter deck. Verdict: And they wasted the “For the Greater Good” line on this. WWDrakey & Ire - 3 out of 5. Quite similarly to Irving above, these fanatics do pack a wallop... and not being able to screw with attackers/defenders can screw up some decks up quite bad. Still, the same also goes here for the inherent risk in using all of your domains for these guys, only to have them go On the Lam on you. This, hunter characters and Gregory Lean plus +perhaps red tape and st huberts key and The Great Work should mitigate the removal effect weaknesses mentioned above no? Sure, if you can reliably draw all those things, you could protect just about anything. So much protection there with all those cards, not getting one or the other still seems fine. I'm not saying you need to get all those. You just asked if a 7+ card combo could protect your guys, and my general answer is "yes, a 7 card combo will probably protect you from almost anything." For that matter, a 4 or 5 or 6 card combo will probably protect you fine about 95% of the time. But if I'm trying for a 4+ card combo, I'm not interested in just protecting my guys. IMO, if you're putting so much effort into such a large combo, I think you'd be better off making it a combo that will win you the game, not merely negate your opponent's removal. Keep in mind also that you have to build up such a large combo over multiple turns, and it's not like your opponent can't see what you're doing. He'll probably either rush you and win the game before you can get fully set up, or he'll use removal to break up your big combo as you're setting it up. One other observation is that I personally don't want Gregory Lean in my Hunter deck. I think the undisputed best Hunter in the game is Grete, and she and Greg don't get along, if you know what I'm saying. If you're looking to protect Grete from Plague Stone or Stygian Eye or Dimensional Rift, I think you need to look to someone other than Greg. I know you could run Tyler Scindere, but now you're running a 4-cost loyal character (Grete) in a dual-faction deck, and your combo has just got even bigger. Just my opinion, but try it out for yourself. Maybe you'll prove me wrong. I think there is no undisputed best hunter. Grete is neat, but I personally am more likely to use Peerless Tracker, Relentless Stalker and Supernatural investigator. Agreed. Grete's a threat (especially if backed up with H of A), but she's strictly for mono decks. She's the sort of card you might use as a cornerstone, but she's not flexible enough to make the cut in most decks that aren't just made for her. Let me clarify what I said: I don't think there's another Hunter character in the game who can single-handedly take over a game like Grete can. Review FunkeXMix's premise above: Hunters of Ardenne, other hunters, Gregory Lean, Red Tape (Loyal), St. Hubert's Key, The Great Work. We're discussing a hypothetical deck that is primarily, if not entirely, Agency and is intent on enabling its Hunters to shine. So, IMHO, the one Hunter who is most likely to single-handedly win you the game in this context is Grete. 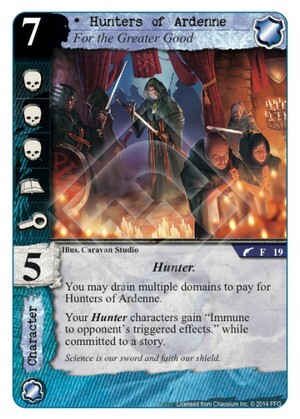 And my larger point to FunkeXMix was, if you're looking to Gregory Lean to protect your Hunters, it's probably not going to work in protecting your cornerstone (good word choice, Carthoris) Hunter because she's Heroic and he's Villainous. I didn't mean to imply that Grete fits as easily in every deck design as Supernatural Investigator does. I understand that's the case. I was just saying that, in the type of deck that she's meant for (the deck that FunkeXMix is proposing), Grete is the most powerful Hunter character in the deck. When you read the reviews on LT Wilson Stewart, everyone gives him 5 stars because they're all assuming he's being used in an Agency-heavy Government-heavy deck. Obviously, Agency Medic is more flexible though, and fits better in a wider range of decks.